Silicone Baking Mat Set (3) Non-Stick Cookie Sheets - 2 Half Sheets and 1 Quarter Sheet - Baking Sheets For Bread Making Pastry Macarons Biscuit Buns - 16-5/8 x 11 Inch - Bonus Ebook! View More In Kids' Baking Supplies. Love baking but loathe messy cleanups? Culinary Couture thinks you should have the best of both worlds. PERMANENT NON-STICK: Nothing sticks! Even after 1000's of uses. ULTRA SAFE: 100% food-grade silicone. FDA and LFGB approved. Non-toxic, eco-friendly and BPA free. DURABLE and CONSISTENT: Your pastry mat won't absorb food odors or flavors. Microwave, oven, and freezer safe. Can be used over 4000 times! MULTI-PURPOSE: Superb as a cookie sheet. Versatile with pastries, fish, meats, vegetables, pizzas, croissants, fruits, macaroons, kneading dough, hot sugar, candies, -any food you can imagine. Your one stop baking solution. CONVENIENCE: Fits easily in a half-sized baking sheet (18" x 13") and quarter size (13" x 9"). FAST CLEANUP: Just wash with warm, soapy water and air dry. The days of messy cleanups are over. All your baking sheets will be clean! EASY STORAGE: Lightweight and flexible to allow roll up and storage in minimum space. SAVE MONEY, IMPROVE HEALTH: Eliminate the need for oils, grease, sprays, aluminum foils, butter, and parchment paper. This permanent non-stick silicone baking mat will save money and pounds around your waist. TRIPLE VALUE: Three Culinary Couture silicone baking mats are included. Keep all for yourself or give one away as a gift! SATISFACTION GUARANTEED: We stand by our products 100%. If at any point you are not satisfied we will refund you 100%, no questions asked. So ORDER now while these are still in stock! HIGHEST QUALITY BAKEWARE SET: Premium nonstick silicone baking mat set, 3 pack. Two different sizes to cover all your baking needs! 2 half sheets (16-5/8" x 11") and one quarter sheet (11.5" x 8.5"). Best in class quality, reusable over 4000 times! Fits perfectly in a half sized baking pan (18" x 13") and quarter size pan (13" x 9"). A wonderful gift idea for the holiday season! SAFETY and QUALITY: FDA and LFGB approved. Professional Grade 0.75mm thickness. Non-toxic, BPA free, eco-friendly, and odorless. Flavors or odors will not permeate this baking mat. Everything cooks evenly without uneven browning. Food comes out delicious every time. Great reviews from chefs worldwide! SAVE TIME, MONEY, and CALORIES: Find out why this is the baker's choice! No need to grease your cookie sheet or baking pans with cooking sprays, oils, parchment paper, or aluminum foils again. To clean, simply rinse off in warm soapy water and air dry. The days of struggling with greasy pans and parchment paper are over! 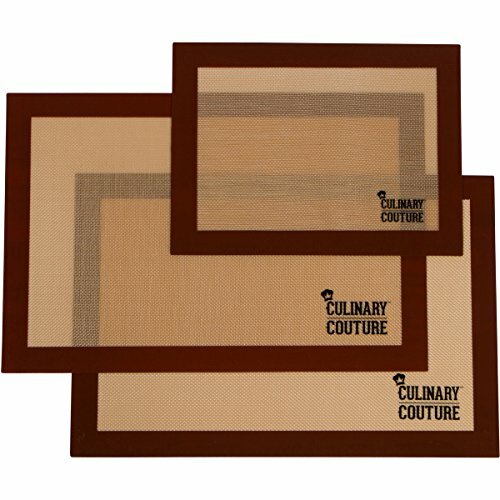 DURABLE and LONG LASTING: Culinary Couture silicone baking mats can be used thousands of times! Heat-resistant performance in temperatures from -40 to 480 degrees Fahrenheit. Microwave, Oven, and Freezer safe. Use as a cookie sheet liner, pastry mat, or just for rolling dough. Makes for a great great wedding / bridal / birthday / kitchen shower present. Very kid-friendly too. A secret tool for every kitchen! FREE GIFT INCLUDED: VALUED AT 10$: Comes with a bonus free ebook cookbook (as an email attachment once product is delivered). Contains 35+ delicious cookie recipes! BUY now and take advantage of our special Spring discount sale price. If you have any questions about this product by Culinary Couture, contact us by completing and submitting the form below. If you are looking for a specif part number, please include it with your message.